Southland Snapshot: May SLP Month & RAFFLE KICKOFF - Southland Therapy Services, Inc. 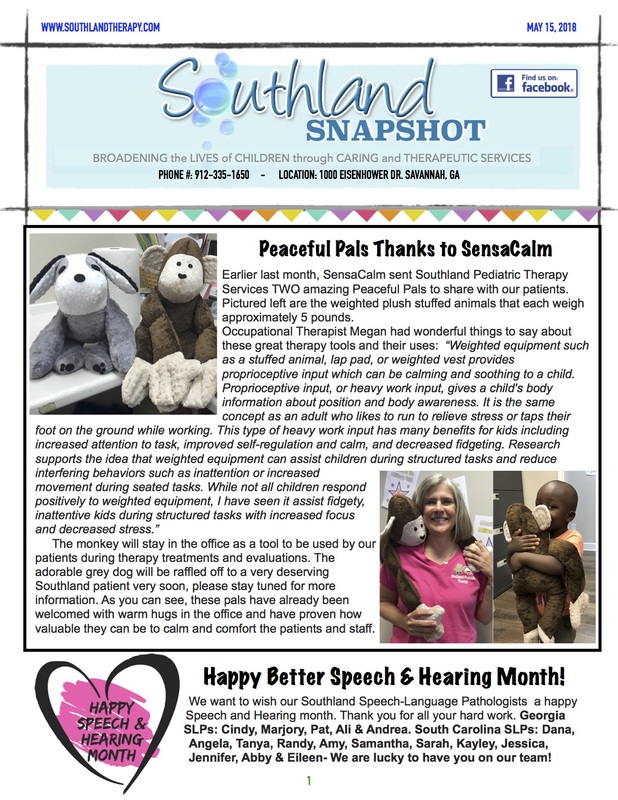 Earlier last month, SensaCalm sent Southland Pediatric Therapy Services TWO amazing Peaceful Pals to share with our patients. Pictured left are the weighted plush stuffed animals that each weigh approximately 5 pounds. The monkey will stay in the office as a tool to be used by our patients during therapy treatments and evaluations. The adorable grey dog will be raffled off to a very deserving Southland patient very soon, please stay tuned for more information. As you can see, these pals have already been welcomed with warm hugs in the office and have proven how valuable they can be to calm and comfort the patients and staff. We want to wish our Southland Speech-Language Pathologists a happy Speech and Hearing month. Thank you for all your hard work. Georgia SLPs: Cindy, Marjory, Pat, Ali & Andrea. South Carolina SLPs: Dana, Angela, Tanya, Randy, Amy, Samantha, Sarah, Kayley, Jessica, Jennifer, Abby & Eileen- We are lucky to have you on our team! Southland Therapy celebrated our military kids, with thanks to the Military Child Education Coalition, during the month of April. The military kids we serve are some of the toughest kiddos around and we were happy to award them with a certificate to honor their hard-work and sacrifice. Thank you for your service to our country and for letting us be a part of your journey. Southland loves our Military Kids! summer goodies like sidewalk chalk, bubbles, sand toys and a $50 Target gift card! Want to know how to win? Like or Follow us on our social media pages, write a review and then place your name in the box located in the office. A winner will be selected on May 31st! On Thursday, April 26th, Owners Dee Dee and John along with Outreach Coordinator Laura and her husband Jacob, attended the the “Best of the Best” finalist event. Surrounded by lots of amazing entertainment and delicious food, the night was a great success. Southland Pediatric Therapy could not have been a finalist without your support- THANK YOU!